According to the Call of Duty Endowment, one third of working veterans are underemployed, and the amount of veterans asking for help in this regard has increased 59%. In 2018, the average cost-per-placement for veterans in jobs was $522 for the Endowment, which is “nearly six times as effective as United State Government efforts.” 93% of these job placements were for full-time work, with an average starting salary of over $58,000, and those in positions showed a 87% six-month retention rate. Read on to find out how you can help Veterans in the US or UK through the Call of Duty Endowment. You want multiplayer? You got it. You want zombies? You won’t have to eat your own heart out. You want more battle royale? Really, you do? Well, okay, you’ve got that too. The soundtrack is Welcome To The Party by Diplo, French Montana & Lil Pump ft. Zhavia Ward. Activision and Treyarch have released a brand new gameplay trailer for Blackout, Call of Duty: Black Ops 4’s all-new Battle Royale mode that delivers signature Call of Duty gameplay immersed in Classic Environments and Characters from the Black Ops universe. It’s time to soldier up because Black Ops is back! The series which has become the most played in Call of Duty history as well as a cultural phenomenon around the globe returns October 12th with the release of Call of Duty: Black Ops 4, a gritty, grounded, all-out combat experience. Black Ops 4 raises the bar for Multiplayer mode that increases tactical gameplay and player choice, along with the biggest Zombies offering ever with three full experiences at launch, and Blackout, where the Black Ops universe comes to life in a massive battle royale experience featuring iconic characters and locations from all four Black Ops games in a one-of-a-kind offering that is uniquely Black Ops. 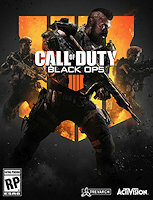 Published by Activision and developed by award-winning studio Treyarch, Call of Duty: Black Ops 4 transforms the established universe played by hundreds of millions of fans with the largest gameplay experience ever created in the series. Call of Duty: Black Ops 4 is scheduled for release on PlayStation 4, Xbox One and PC on October 12th. Fans can pre-order now and get access to the Call of Duty: Black Ops 4 Private Beta. Black Ops 4 for the PC delivers a fully-optimized experience, which for the first time in Call of Duty’s history will be available exclusively on Battle.net, Blizzard Entertainment’s online gaming service. View the Call of Duty: Black Ops 4 “Behind the Scenes” Trailer HERE. Call of Duty: Black Ops 4 features gritty, grounded combat, along with new levels of customization and tactical gameplay, and a variety of new weaponry, maps and modes for the ultimate Black Ops multiplayer experience. The game features the return of the iconic Pick 10 system, along with a series of innovations in weapon controls, combat flow, health regeneration, and player movement. Black Ops 4 goes deeper than ever before into the fiction of multiplayer, where players will explore the world of Specialists – who they are, why they exist, and what battles they fight together – while mastering their gameplay through solo and multiplayer combat experiences. Black Ops 4 features a combination of new and returning Specialists, each with their own unique weapons, equipment and playstyles. Players will be powerful alone, but devastating as a team working together. For more intel about Call of Duty: Black Ops 4, be sure to visit CallofDuty.com/blackops4. Activision including Black Ops 4 Battle Royale Mode in the next Call of Duty title seems a strong likelihood to us. Back in March we reported it would not be a surprise to see Battle Royale introduced, this was for many reasons. A recent report from Polygon states “Black Ops 4 won’t have traditional single-player campaign, will instead focus on Multiplayer and Zombies”. On top of this Charlie INTEL recently tweeted a report stating “a tipster also informed CI that Raven Software has reportedly been tasked with adding a Battle Royale mode to Call of Duty: Black Ops 4 to fill the content gap of no campaign”. This sounds to be the making of an extremely shrewd business decision by Activision on multiple levels. I’m sure a previous Activision meeting went along the lines of “Why include a campaign which takes up a considerable portion of the budget and development time, when you can include a new hyped game mode which has the potential to generate huge amounts through micro-transactions”. This ties in with our earlier article where a report suggested “Activision is keenly aware of how other publishers have benefited from releasing titles in the popular Battle Royale genre”. With no single player campaign, this also allows Activision to use the established and popular ‘Black Ops’ brand without having to tie it into the storyline. The setting and mechanics do not have to corroborate with the timeline of Black Ops 3, which is important given the general dislike of boost jumps and Exo Suits. Of course we expect Easter Eggs and references back to the previous series but this is much less of an undertaking than fitting in a whole new storyline. Black Ops is back! In what represents a game-changing experience, Call of Duty: Black Ops 4 will revolutionise the top-selling series in Call of Duty history when it launches worldwide on Friday, 12th October for the PlayStation 4, Xbox One and PC. Call of Duty fans can tune in Thursday, 17th May, when publisher Activision, a wholly owned subsidiary of Activision Blizzard, and award-winning developer Treyarch host the community reveal to a worldwide audience. View the official Call of Duty: Black Ops 4 teaser trailer HERE.